Follow-me is a tracking software. Each performer (or: target) requires an operator and Follow-Me allows each operator to assign unlimited fixtures from any manufacturer in any orientation to their target. Multiple persons can be followed from one machine. 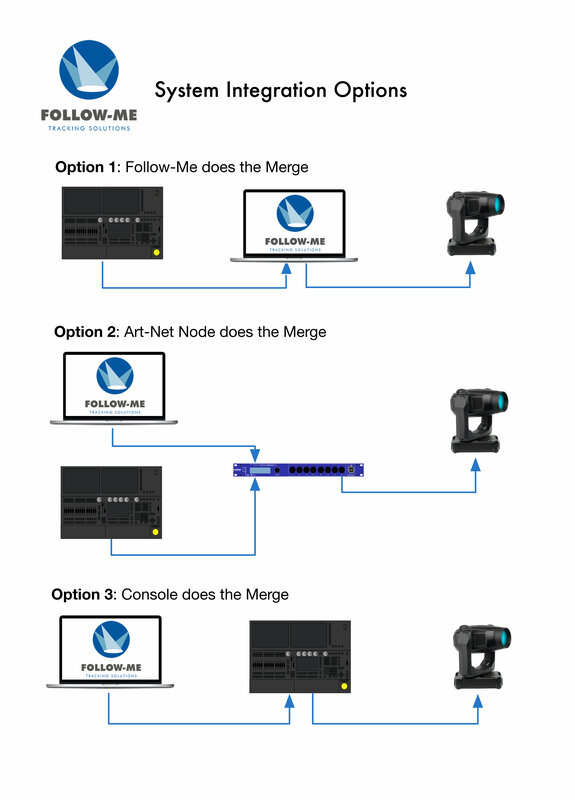 Via a control channel Follow-Me allows full fixture control to be returned to the lighting console. All fixtures patched in Follow-Me can be assigned to any target. With the Follow-Me package anyone can start following people with any moving heads. Use of traditional spotlights is often takes up a lot of space and also costs a bunch. The risk assessments from having to put followspotters in dangerous positions also take a lot of time. With Follow-Me, these things are now in the past. Follow-Me can be used with any light that is able to pan and tilt from any manufacturer. No new specific moving heads are needed in your setup, resulting in further cost savings. A complete Follow-Me system barely takes up any space, and can thus easily be transported in a compact peli-case, reducing transport and logistics costs. Follow-spotters can now stay seated in a safe area backstage, instead of having to go up in dangerous positions for multiple hours. Also, if you want to follow more people, the software has you covered. All you need is another Follow-Me Mouse Console, so you can follow an unlimited amount of persons with one system. Thanks to the network-based structure, multiple 3D mouse consoles can be integrated into the system via network cables and controlled live by a corresponding number of operators. For the Follow-Me software, we have two kinds of licenses. With the lite license, you are only able to control 3 fixtures with one target, while with the full license you are able to control an unlimited amount of fixtures with an unlimited amount of targets. Setting up and using Follow-Me is easy. The software is able to store the X, Y and Z values ​​of the moving lights and the stage - data that can be determined in no time or taken from CAD drawings or visualizations. The system works live and works absolutely fluently and realistically through the control of human operators. An operator receives the complete overview via the camera fed directly into the software. The control of the so-called "target"-cross is done via the own Follow-Me Mouse Console, which consists of encoders and buttons to be mapped to any certain action. Additionally, Follow-Me Fader Consoles are available to for example control height offset or gobo's. 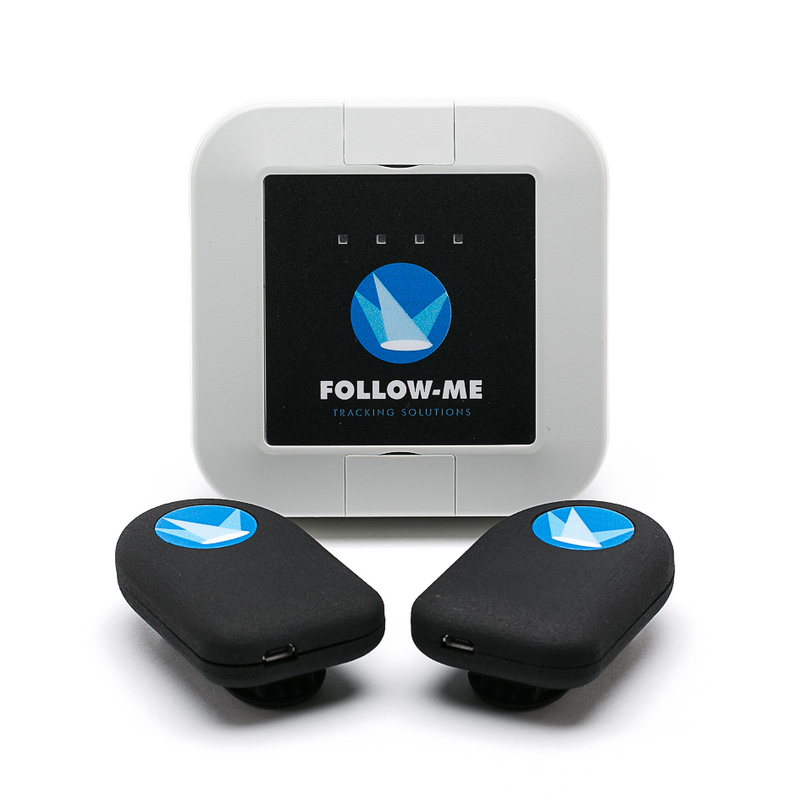 All Follow-Me hardware products were developed under the aspect of absolute touring ability. To an existing Follow-Me system you can always add more moving heads, add more mappings and also add certain extensions such as TraXYZ autotracking. By merging with the light control desk, the position can be recorded and tracked live by the Follow Spot operator. All other data comes from the console operator. The specially designed fixture for the Follow-Me software allows the desk operator to specify for each cue exactly who has control of the moving lights and their channels. This saves budget especially for smaller productions, because the Moving lights used are not blocked by the Follow-Me control, but can be fully integrated into the light show at any time. For more complex shows with moving elements Follow-Me has a motion control integration and the PSN protocol. With Follow-Me TraXYZ, the Follow-Me system is transformed to an automated tracking solution, with the advantage of not needing operators to manually follow the performers. The performers wear small tags. Multiple fixtures can be assigned to follow the performers through automated tracking. By adding a TraXYZ server to a Follow-Me system, you have the advantage of a clear screen view as a visual reference of the performers at all times and still the possibility to manually take control when preferred. This is an extension on top of the Follow-Me software. If you have any questions regarding the use of autotracking for your show, please get in touch with us so we can propose a custom solution for your project.